Being resourceful often requires one to think “outside the box.” However, it has been my experience that sometimes being resourceful actually requires one to be acutely aware of the box. Not to just think outside the box but to think about the box itself. Never was this more evident than the time I decided to replace the rear differential gasket on my old ’72 Pontiac LeMans. 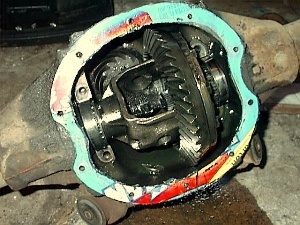 The rear differential was leaking gear oil. (The car was around 20 years old at that point, so it was to be expected.) I decided to remedy the situation by replacing the differential cover gasket. I ran out to Dyer Auto Parts (which doesn’t exist anymore) and asked for a 10 bolt differential cover gasket for a ’72 LeMans. I hadn’t yet lost my faith in the abilities of others, so I accepted what he gave me without really scrutinizing it. As it turns out, my trust in the competency of the parts counter clerk was a mistake. When I put the gasket up to the differential cover, the two didn’t match. A quick use of rudimentary arithmetic skills showed that what I had received was, in fact, a 12 bolt cover gasket instead of the 10 bolt gasket I had asked for. find an old GM vehicle with a 12 bolt differential, remove the rear axle assembly from it, replace the gasket with my ill-fitting replacement part, and then replace my axle with the (likely illicitly obtained) 12 bolt rear axle. seal up the rear differential cover with something other than my ill-fitting replacement part. For obvious reasons, I chose option #2. A quick scan around my garage showed some promise. I found some material that looked an awful lot like gasket material, and when combined with a little RTV gasket sealant, would probably do the trick. 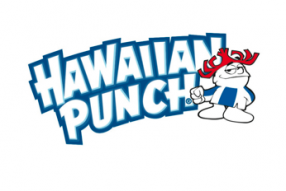 It was a case of Hawaiian Punch cans. I ripped open the case, used my differential cover as a guide and traced the shape and bolt hole locations onto the cardboard. Add some scissors, Permatex part# 77B and a steady hand – and voila! We have a new gasket! I bolted it back together, checked for leaks, and slept soundly knowing that I didn’t have to abandon my big yellow car the next morning in favor of a bigger yellow bus. As a matter of fact, the gasket worked so well that I completely forgot that I had done it until I was reminded about 5 years later. One cold and snowy morning while driving to work, my car made a horrendous banging sound as I was pulling away from a stop light. It then proceeded to make lots of smaller clunking sounds as I drove on that increased frequency as my speed increased. My buddy Billy lived close by, so I limped the Pontiac to his place. I determined the problem was the rear differential, so I naturally pulled the cover off. It was then, that I was greeted by a very brightly colored gasket, reminding me of that late evening exercise in improvisation from 5 years earlier. Billy and I got a good laugh out of that one! I had snapped a tooth off of the pinion gear, and ended up replacing the entire rear axle with one from a junkyard salvage. 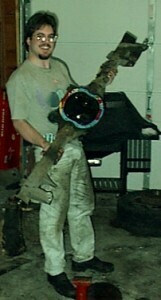 The last picture here is of me after removing the old axle. It just goes to show that where there’s a will, there’s a way. Use the right tool for the job if you have the ability, but if you are in a pinch, you’d be amazed at what will suffice in the right tool’s absence. I have no doubt that the improvised gasket and RTV solution would have lasted even longer, had the pinion gear not given out. Of course… the pinion gear wouldn’t have given out if I hadn’t been hot-rodding the car around like I had a 12 bolt differential with 4.10:1 gears in it! This entry was posted in Motorized Stuff, Randomness, Stories and tagged car, Hawaiian Punch, improvise, LeMans, Permatex, pontiac by Dave Isom. Bookmark the permalink.